So, I had an idea about log cabin piecing using rainbow colors in rainbow order. And I was reading a quilting book about wonky cutting - where you sew your pieces together, press, put them on the cutting mat, then turn them a bit, and cut them smaller. 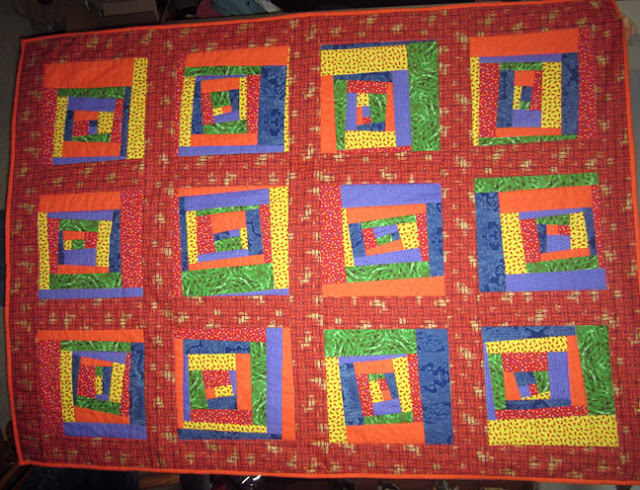 So, two ideas combined into a wonky log cabin rainbow quilt. 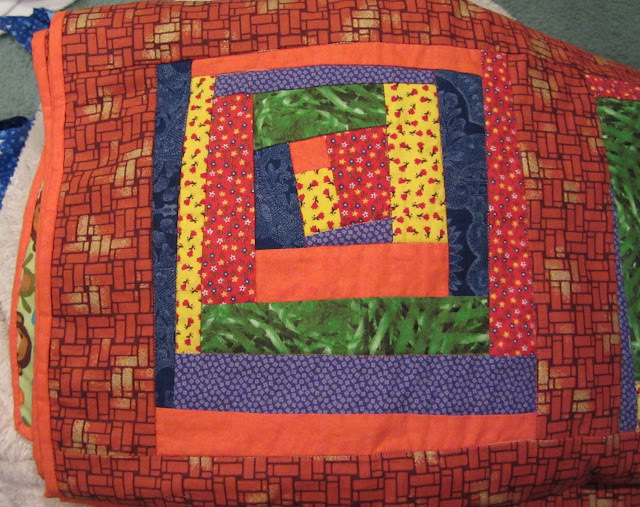 the quilt is actually a rectangle! It's just been photographed strangely. Anyway, I put the three largest strips aside for the first two rounds, and put all the rest in a bowl, and picked them out randomly. Each color was the base color for two squares; one working in the red to orange to yellow direction, and one in the purple to blue to green direction. If that makes sense? an example square - yellow is the first color. Every time the sixth color was put on, they were recut on some angle - except the last go around, where I had to cheat a bit to make the blocks all the same size. 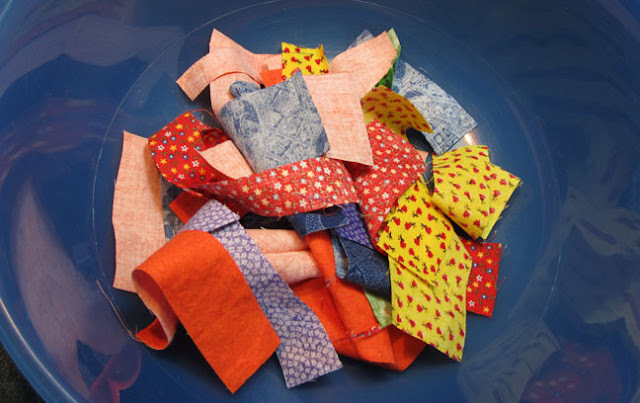 Mostly because I ran out of green and purple (because they weren't actually full fat quarters; I'd already used some pieces of them for other things), I ended up fleshing out many of them with extra orange - the fabric I had the most of. Even so the blocks weren't big enough to make a baby quilt themselves, so I used sashes to make it crib sized. Since I finished this, I saw a book with a five pointed log cabin, rather than the normal square. It looked really neat, and I'm putting it on my list of things to try... one day. At the moment I have a couple of wall hanging sized things in various states of not-doneness. I'm trying to redo my sewing room, but the progress is slow, and without a sewing room, I'm not getting much sewing done!